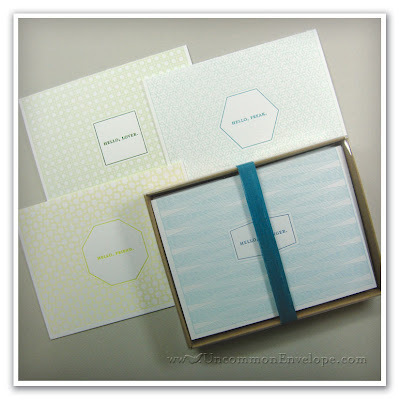 Uncommon Envelope: Facebook 100 exclusive sale! We have hit 100 Uncommon Envelope Facebook fans! As promised, we will be holding an exclusive 3-day sale for our fans only. 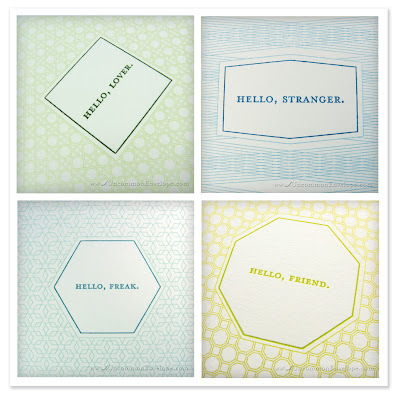 Starting today, June 29, through Wednesday, July 1, you can grab our Hello. Collection cards (singles or sets!) for a whopping 50% OFF! Just visit our Etsy shop, drop what you want into your cart and check out and pay via Paypal. The 50% discount will be refunded to you via Paypal, so don't be alarmed when you are asked to pay for the full amount at first. You will be refunded after your order has been placed. Blank inside, these make great cards to keep handy for any occasion, or grab a set and keep it on-hand as a last minute birthday or hostess gift. We can also put together custom sets if you are looking for multiples of one design or sets larger than 4. Just email me or convo me via Etsy. If you are not yet a Uncommon Envelope Facebook fan and you would like to take advantage of the sale, we will also honor the discount for anyone who fans us in the next 3 days... we will be holding similar special events for future milestones as well. Don't miss out! Happy shopping, and THANK YOU to all our fans for your super support!